Western blot detection of unphosphorylated and phosphorylated rat brain homogenate (left and right lanes respectively) using MA1-047 and MA1-048 antibodies. 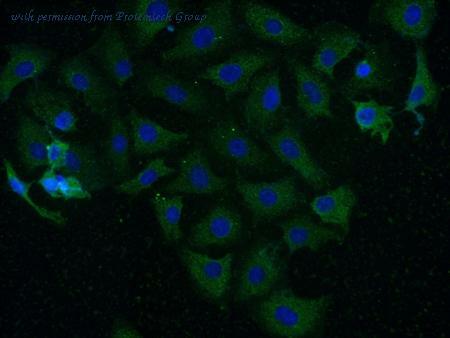 Immunofluorescent analysis of Phospho-CaM Kinase II pThr286 using Anti-Phospho-CaM Kinase II pThr286 Monoclonal Antibody (22B1) (Product# MA1-047) shows staining in Hela Cells. Phospho-CaM Kinase II pThr286 staining (green) and nuclei with DAPI (blue) is shown. Cells were grown on chamber slides and fixed with formaldehyde prior to staining. 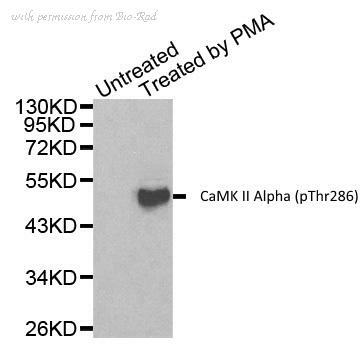 Cells were probed without (control) or with or an antibody recognizing Phospho-CaM Kinase II pThr286 (Product# MA1-047) at a dilution of 1:50 over night at 4 ?C, washed with PBS and incubated with a DyLight-488 conjugated secondary antibody (Product# 35503, Goat Anti-Mouse). Images were taken at 60X magnification. Western Blot Analysis of Calmodulin-Dependent Protein Kinase II: Lane 1: MWM, Lane 2: Mouse Brain, Lane 3: Rat Brain. 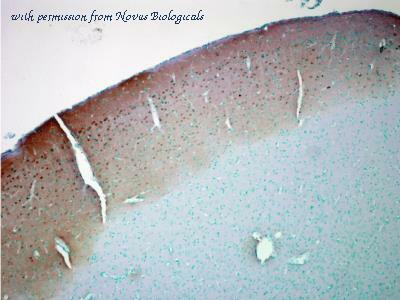 IHC Analysis: Human lung tissue stained with CaMKII, pAb at 10µg/ml. Western Blot Analysis of CaMKII: Lane 1: MWM, Lane 2: Brain (mouse), (tissue extract) (Prod No. ADI-LYTMB100) Lane 3:Brain (rat), (tissue extract) (Prod No. ADI-LYT-RB100) Lane 4: HeLa, (cell lysate) (Prod No. ADI-LYC-HL100) Lane 5: Hs-67 cell lysate. 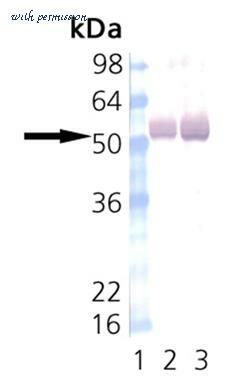 The CAMK2 antibody from Proteintech is a rabbit polyclonal antibody to a recombinant protein of human CAMK2. This antibody recognizes human,mouse,rat antigen. 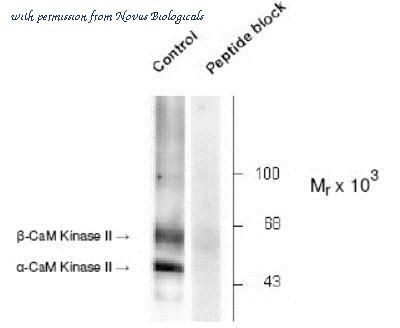 The CAMK2 antibody has been validated for the following applications: ELISA, IF, IHC, WB analysis. CamKII (6G9) Cultured cortical neurons (E18P21). This image was taken for the unconjugated form of this product. Other forms have not been tested. 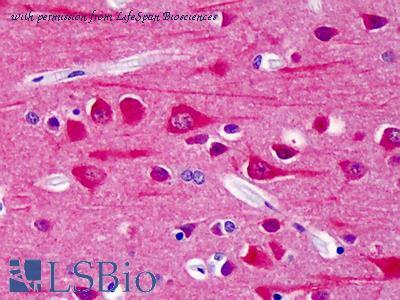 Anti-CAMK2 antibody IHC of human brain, cortex. Immunohistochemistry of formalin-fixed, paraffin-embedded tissue after heat-induced antigen retrieval. Antibody dilution 1:200. Immunocytochemistry/Immunofluorescence: CaM Kinase II alpha Antibody (6G9) [NB100-1983] - Tissue: dissociated hippocampal neurons. Species: Mouse. Fixation: Cold 4% paraformaldehyde/0.2% glutaraldehyde in 0.1M sodium phosphate buffer. Primary Antibody: Mouse Anti-CaMKII Monoclonal Antibody at 1:1000 for 12 hours at 4C. Secondary Antibody: FITC Goat Anti-Mouse IgG (green) at 1:50 for 30 minutes at RT. Magnification: 10X. Courtesy of: Mary Kennedy, Caltech. Immunohistochemistry: CaM Kinase II alpha Antibody (6G9) [NB100-1983] - Tissue: colon carcinoma. Species: Human. Fixation: Formalin. Primary Antibody: Mouse Anti-CaMKII Monoclonal Antibody at 1:10000 for 12 hours at 4 degrees C. Secondary Antibody: Biotin Goat Anti-Mouse at 1:2000 for 1 hour at RT. 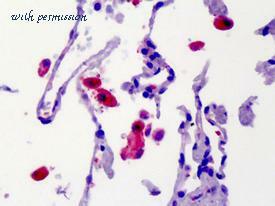 Counterstain: Mayer Hematoxylin (purple/blue) nuclear stain at 200 ul for 2 minutes at RT. Magnification: 40x. 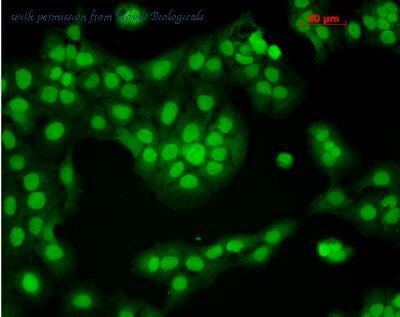 Immunocytochemistry/Immunofluorescence: CaM Kinase II alpha Antibody (6G9) [NB100-1983] - Tissue: HaCaT cells. Species: Human. Fixation: Cold 100% methanol for 10 minutes at -20 degrees C. Primary Antibody: Mouse Anti-CaMKII Monoclonal Antibody at 1:100 for 1 hour at RT. Secondary Antibody: FITC Goat Anti-Mouse (green) at 1:50 for 1 hour at RT. Localization: Nuclear Staining. Western Blot: CaMKII alpha [p Thr286] Antibody [NB300-184] - Anaylsis of Rat brain lysate showing specific immunolabeling of the ~50k a- and the ~60k beta-CaM Kinase II phosphorylated at Thr286 (Control). The phosphospecificity of this labeling is shown in the second lane (lambda-phosphatase: lambda-Ptase). 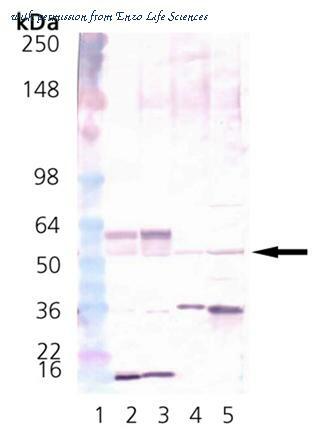 The blot is identical to the control except that it was incubated in lambda-Ptase (1200 units for 30 min) before being exposed to the Anti-Thr286 CaM Kinase II. The immunolabeling is completely eliminated by treatment with lambda-Ptase. 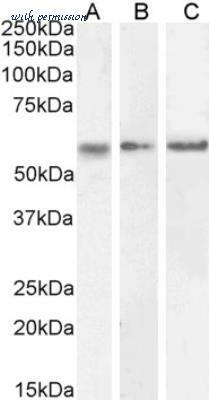 Western blot using Rockland's Affinity Purified anti-CaM Kinase II antibody shows detection of a band ~54 kDa corresponding to human alpha CaM Kinase II (arrowhead lane 1). 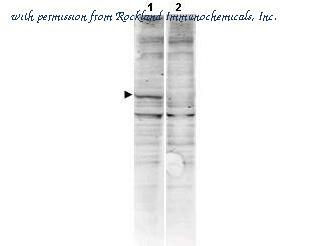 Specific reactivity with this band is blocked when the antibody is pre-incubated with the immunizing peptide (lane 2). Approximately 35 ?g of a mouse brain whole cell lysate was separated by 4-20% SDS-PAGE and transferred onto nitrocellulose. 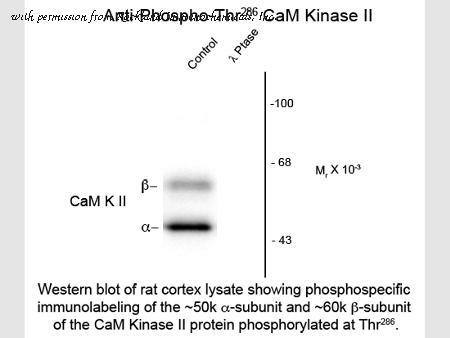 CaM Kinase II was similarly detected on lysates from rat brain (not shown). After blocking the membrane was probed with the primary antibody diluted to 1:1,500 for 2h at room temperature followed by washes and reaction with a 1:10,000 dilution of IRDye™800 conjugated Gt-a-Rabbit IgG [H&L] MX (611-132-122) for 45 min at room temperature. IRDye™800 fluorescence image was captured using the Odyssey® Infrared Imaging System developed by LI-COR. IRDye is a trademark of LI-COR, Inc. Other detection systems will yield similar results. Western Blot of Rabbit anti- CaM Kinase II Thr286 Antibody. Lane 1: rat brain lysate. Lane 2: rat brain lysate incubated in ?-Ptase (1200 units for 30 min). Load: 10 µg per lane. Primary antibody: CaM Kinase II Thr286 antibody at 1:400 for overnight at 4°C. Secondary antibody: IRDye800™ rabbit secondary antibody at 1:10,000 for 45 min at RT. Block: 5% BLOTTO overnight at 4°C. Predicted/Observed size: ~50kDa ?- and the ~60kDa for ?-CaM Kinase II phosphorylated at Thr286. Other band(s): none. Immunofluorescence Microscopy of mouse anti-CaMKII antibody. Tissue: Hippocampal neurons. Fixation: N/A. Primary antibody: anti-CaMKII for 1h at RT. Seondary antibody: Fluorescein mouse secondary antibody at 1:10,000 for 45 min at RT. Localization: Cytoplasm. Staining: CaMKII as precipiated ed signal.